Excellent sport properties (shock absorption, ball rebound, slip resistance). Sportex is an indoor vinyl sport flooring range produced in 5 thicknesses. 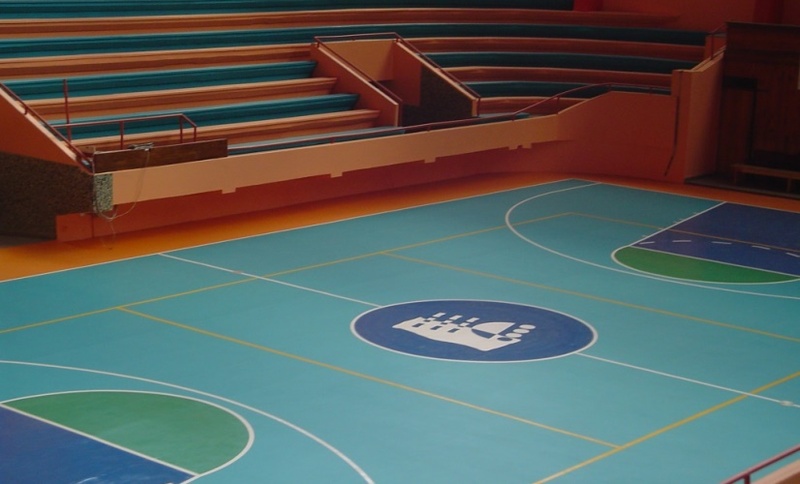 You can combine between our 12 solid colors and 8 wood finishes to give the greatest look to your sport field or your gymnasium. This vinyl flooring brings together performance, comfort and security for the users reducing their injuries and increasing their sensations. Sportex incorporates Supraclean®. A crossed-link polymer treatment for an easy maintenance. It also wears a fungistatic and anti-bacterial treatment for a perfect hygiene. It can be used in gymnasiums, fitness centers, schools, kindergartens. But also in places where a good acoustic performance is required. Sportex Fit fulfills all requirements expected from a gym sports flooring. Compact, the impacts of the weights or the weight of the machines don’t affect it. It is antislippery, easy to clean and very hygienic. Sportex 4.5 responds to all requirements expected from a sport flooring by school gyms, fitness centers or multipurpose halls: resistance, easy cleaning and budget. It is manufactured in 3 colors and 1 wood finish. Sportex 5 responds to all requirements expected from a sport flooring for school gyms: resistance, easy cleaning and budget. It is produced in 5 solid colors and 1 wood finishes. → High shock absorption and reduction of the vibrations meaning a low risk of injuries. → Optimum ball rebound meaning better playing sensations. → Excellent vertical deformation meaning more comfort. → Uniform friction through the whole flooring meaning the perfect balance for the player. Besides, the hardened and PUR protected wear layer is the guarantee of easy-cleaning, hygiene and resistance to abrasion. Sportex 6 can be installed in schools, multipurpose halls, fitness and aerobic rooms. It is produced in 6 solid colors and 2 wood finishes. Sportex 6.7 can be used from regional to international competitions. It also gives great results in aerobic and fitness rooms. It is produced in 10 solid colors and 6 wood finishes. Sportex 8 can be used from regional to international competitions. It also gives great results in aerobic and fitness rooms. It is produced in 8 solid colors and 5 wood finishes. Supralay and Supralay 4 are underlayers developed to overcome the problems due to the possible humidity in the subfloor. The Sportex floor covering is directly glued to the Supralay layer. The Supralay is not glued to the subfloor and works as a humidity barrier. Protecflor is a vinyl protective flooring used in case of special events such as exhibitions, meetings, concerts. Our sport floorings Sportex have to be glued on a dry and even surface with a water-based acrylic adhesive. In case of humidity in the sub-floor, you can use a bi-component PU adhesive. According to the humidity ratio, is it possible to use the humidity barrier Supralay. In order to offer an easier and cheaper maintenance, our vinyl floorings Sportex are protected with the Supraclean® treatment. The pores of the floorings are sealed, avoiding the dirt to penetrate. Sportex must be cleaned with a neutral detergent for vinyl floorings (Dr. Schutz, Ecolab, Johnson). You can clean it either manually or with a rotative cleaning machine.